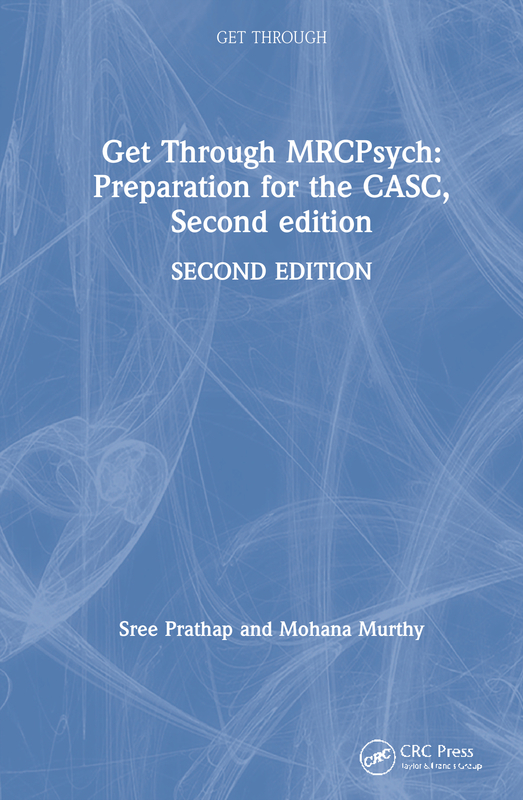 Get Through MRCPsych: preparation for the CASC is a second edition of Get Through MRCPsych Part 1: Preparation for the OSCES - 978-1-85315-590-X. This book will not only prepare you for the examination, but will also help you face clinical situations confidently and effectively. The author, Sree Prathap Mohana Murthy, has passed the MRCPsych examination and has been running an OSCE/CASC course in London since 2005. Get Through MRCPsych: Preparation for the CASC is an essential revision tool for all candidates preparing for this new exam. This book provides 62 questions and answers based on a broad variety of syllabus topics and at a range of levels of complexity. It offers helpful hints and tips on what to expect and how to negotiate the exam successfully. Modelled on the original OSCE, the Clinical Assessment of Skills and Competencies (CASC) exam is the final part of the new MRCPsych examination. Candidates attend six linked pairs of 12-minute stations designed to test their competency in clinical skills appropriate to their stage of training. I found this book so far quite a helpful starter. The exam is quite daunting and I thought that [this book] was well pitched for the beginning of revision. I bet in the heat of the exam I will be glad to remember the basics and the simple structures for tackling the stations rather than getting muddled over the complex stuff and run out of time. After all 7 minutes is hardly anything! Overall, I'm glad I bought it.